John Salmons made the go-ahead layup with 6.8 seconds left, Marcus Thornton scored 25 points, and the Sacramento Kings snapped a four-game losing streak by beating the New Orleans Hornets 99-98 on Wednesday. The Hornets led by one and inbounded with 8.9 seconds left, but Isaiah Thomas stole Trevor Ariza's pass and quickly spotted Salmons cutting to the basket for a left-handed layup. Jarrett Jack had 25 points and Ariza 20 for the Hornets, who lost their third straight and fifth in six games. Chris Kaman had 18 points, 11 rebounds and eight assists. Tyreke Evans had 13 points for the Kings, who had dropped 10 of their previous 12 games. 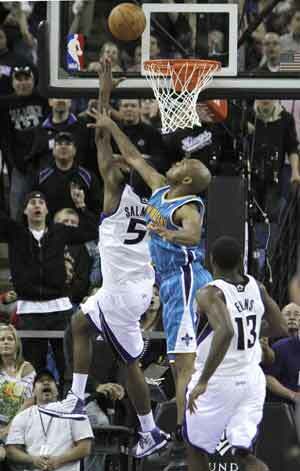 Jason Thompson, Salmons and Thomas all had 12 points, and Jimmer Fredette scored 11.